Location: Saint-Étienne-Vallée-Française, in the Lozere departement of France (Languedoc-Roussillon Region). Notes: Château de Cambiaire was built in the fourteenth century in the town of Saint-Étienne-Vallée-French, department of Lozere. 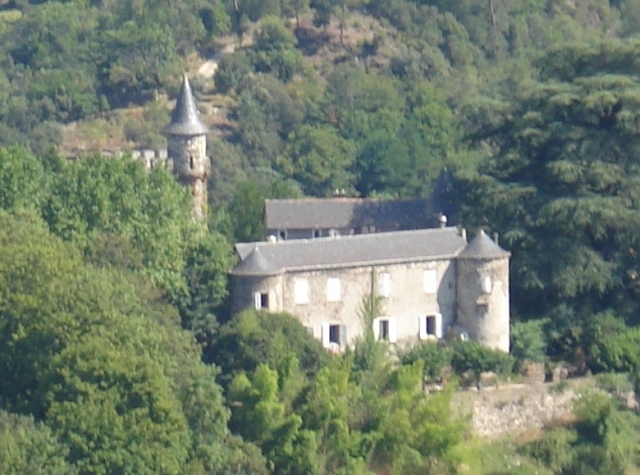 This castle stands just above the village of Saint-Étienne-Vallée-French Lozère. It is a quadrangular building with a round tower at three of its corners and a square tower at the northwest corner. It consists of three wings around a courtyard on the west side by a battlements surrounding wall pierced by a gate. The great crenellated tower, which dungeon office, is crowned on its summit terrace of a watchtower with a roof shaped pepper shakers. This square building built shale stone mixed with white quartz is the oldest. It has three levels, the first two date from the fourteenth century, the last level and the spiral staircase from a raising of the late fifteenth century. This tower seems more ostentatious than most military as much as the castle was never the castle of Saint-Etienne. One of the ground pavement dwelling is probably contemporary dungeon. The others are the result of rearrangements of the modern era and those of the late nineteenth century and finally repairs arising out the 1944 fire. A park of chestnut trees and cedars surrounding it. There is a replica of the Lourdes grotto and a chapel dating back to 1875 in neo-Gothic style.